Guanosine monophosphate (GMP), also known as 5'-guanidylic acid or guanylic acid (conjugate base guanylate), is a nucleotide that is used as a monomer in RNA. It is an ester of phosphoric acid with the nucleoside guanosine. 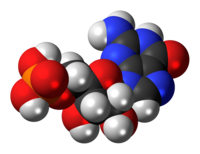 GMP consists of the phosphate group, the pentose sugar ribose, and the nucleobase guanine; hence it is a ribonucleoside monophosphate. Guanosine monophosphate is commercially produced by microbial fermentation. It is known as E number reference E626. As it is a fairly expensive additive, it is usually not used independently of glutamic acid or monosodium glutamate (MSG), which also contribute umami. If inosinate and guanylate salts are present in a list of ingredients but MSG does not appear to be, the glutamic acid is likely provided as part of another ingredient, such as a processed soy protein complex (hydrolyzed soy protein), autolyzed yeast, or soy sauce. GMP can also exist as a cyclic structure known as cyclic GMP. Within certain cells the enzyme guanylyl cyclase makes cGMP from GTP. cGMP plays an important role in mediating hormonal signaling. ^ "The Vegetarian Resource Group Blog". www.vrg.org. Retrieved 25 April 2018. ^ a b Voet, Donald; Voet, Judith G. (2012). Biochemistry. USA: John Wiley & Sons Inc. pp. 1107–1109. ISBN 978-0-470-57095-1. This page was last edited on 7 December 2018, at 00:08 (UTC).